Late last week I told you the important development that billionaire anti-gun zealot Michael Bloomberg revealed his endorsements for the 2014 elections here in Minnesota. Everybody knows that when Bloomberg gets involved in a race that he plays for keeps. And â€œplaying for keepsâ€ usually means coming in and spending vast amounts of cash to promote his radical agenda: outright gun-control. But Minnesota Gun Rights is prepared, thanks to help from gun-rights supporters like you, to fight back tooth and nail. More on that in a minute. Politicians that are bent on destroying our gun rights do all they can to hide their record from the voters come election time. It’s par for the course coming out of St. Paul, really. A politician votes against a pro-gun bill or sponsors an anti-gun piece of legislation to appease radical special interest groups â€“ often from out of state â€“ and then tells you how much he supports your rights when seeking your money and your votes. I have to tell you, nothing makes me angrier than to see confused gun owners being lied to by anti-gun politicians. As Election Day gets closer, Minnesota Gun Rights is working overtime trying to make sure to EXPOSE the records of anti-gun politicians. We do this via targeted direct mail, focused Facebook advertising, phone calls and more. So when Bloomberg made his big reveal last week, Minnesota Gun Rights sprang into action. On Saturday, we kicked off a week-long special educational program on KTLK radio in Minneapolis to help voters in House District 56B (Burnsville) understand that Representative Will Morgan is one of only SIX candidates to be endorsed by anti-2nd Amendment zealot and billionaire Michael Bloomberg! Bloomberg’s agenda isn’t about safety. It’s about CONTROL. Bloomberg is working every day, day in and day out, to build a groundswell of support for gun-control so that he can cram his trophy legislation through the Minnesota State Legislature: Universal Gun Registration. 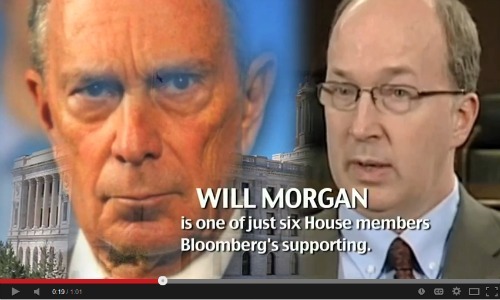 If Bloomberg can help candidates like Will Morgan run rough shod over our rights, vote to take guns away from Minnesotans for misdemeanors, and hang out in smoke filled back rooms in St. Paul conspiring with Michael Bloomberg’s team of lobbysists to take away our freedoms without consequence â€“ then I fear for our rights and the gun rights of our children and grandchildren. Bloomberg will do everything he can to make sure the voters in district 56B don’t know his REAL agenda â€“ and we are determined to make sure that pro-gun voters in that seat know the truth. Click below to hear for yourself the ad we’ve unleashed on the airwaves in Burnsville! I’ve got to tell you, we’re already getting a tremendous amount of feedback from House District 56B! Outraged gun owners in this district, who had no idea about the real Will Morgan, are already making sure he understands their displeasure with his cozying up to billionaire anti-gun zealots. We need to keep this going! More, it’s essential that we get this message on the radio in at least 3 more districts. If we don’t, anti-gun legislators and candidates will continue to gloss over and outright lie about their records in office. We simply can’t let that happen! That’s why we simply must continue to pull back the curtain on the records of these radical anti-gun politicians. I need your help to do it. First, I need to raise $1,700 for editing and production costs and to keep the ads running on KTLK radio to educate voters in House District 56B. In House District 30B, pro-gun candidate Eric Lucero is running against candidate Sharon Shimek, who is outright REFUSING to tell gun owners where she stands on your gun rights! At $60 per ad, I need $1,500 to get ads running in Otsego. Up in Pine and Kanabec counties in district 11B, candidate Jason Rarick is challenging Representative Tim Faust for the seat and returned our candidate questionnaire 100% pro-gun. Faust, however, is desperately trying to avoid having to put his views on the 2nd Amendment on the record. To get up on WCMP radio in Pine City I need to raise $1,120 to be effective. All told, I’m hoping to raise $6,442.10. Can you help out? We simply must run these programs so that pro-gun voters know where the candidates stand when it comes to their gun rights! Listen to the ad below – make sure your speakers are turned up. At an average cost of $37.70, you can invest directly in the gun rights fight here in Minnesota at any level you choose! $188.50 will allow me to place five ads rights away. For $113.10, I can purchase three ads. Even $37.70 will still enable me to place one key ad in one of these critical races. And if you want to place ten ads, which will allow me to get these ads running in all of the districts I mentioned above, that can be done for just $377! I hope you’ll help out right away, knowing that your donation will be put to immediate use in targeted districts where you can know they are doing the most good. Whatever you can do, please do it right away! P.S. Bloomberg and the anti-gun legislators and candidates he is supporting are going all out trying to keep their anti-gun votes/views/records a secret from the voters in their districts. They know that if the truth came out about their records, that gun owners would be sure to tell their friends as the fall election approaches. Perhaps no one is trying to hide their cozy relationship with Michael Bloomberg harder that Representative Will Morgan in House District 56B (Burnsville). His endorsement by America’s biggest advocate for Universal Gun Registration and outright Gun Confiscation needs to be exposed! That’s why Minnesota Gun Rights has unveiled the ad below and has it running, beginning last Saturday, all week on KTLK in Minneapolis. There are at least 3 more districts where it’s absolutely crucial that we inform gun owners about where the candidates stand. But I simply don’t have the budget to run the ads in all of these races right now. At an average cost of $37.70 per ad, you can invest directly into the gun rights fight in Minnesota! $188.50 will allow me to place five ads rights away, $113.10 will purchase three ads, and $37.70 will still enable me to place one key ad in one of these critical races right away. I hope you’ll help me right away, knowing that your money is going to this fight right here in Minnesota!